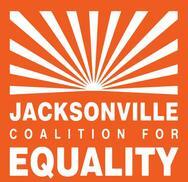 It's Time for LGBTQ Protections in Jacksonville! Join the Jacksonville Coalition for Equality's (JCE) grassroots effort of business leaders, lawmakers, faith leaders, members of the LGBT community and concerned residents who have come together across party lines to update Jacksonville's Human Rights Ordinance (HRO) to include sexual orientation, gender identity and gender expression. With beautiful beaches, riverside and cityscape, Jacksonville is a place anyone would want to call home. The River City boasts the 12th largest population in the country and is bigger in size than any other city in the lower 48 states. But unfortunately it is also has the distinction of being the second largest in the country without full protections for its lesbian, gay, bisexual, transgender and queer (LGBTQ) friends, family and neighbors. But now we have the opportunity to change that!